This is my final post of 2018, so I might as well have it deal with the biggest issue of 2019. BC Basketball lost to Hartford in overtime. We were without Mitchell. Tabbs was limited and Chatman rusty. Those are just excuses though, because there is no reason this BC team should be losing to that Hartford team. It's coaching. The lack of depth. The lack of a consistent defensive system. The curious ingame decisions. That's all on Jim Christian. Too often he has more talent and yet his team plays down to his opponent. If they played up to their opponent more often, than we could discuss saving him. But they don't. They are too often flat and without direction. This is not working and it is on the coaching. There is some talent and there are some coaching moments worthy of praise, but not enough of either to compete in the ACC. This post might look foolish in a month. BC might get healthy and start rattling off impressive wins. I doubt it though. I don't think Christian has it in him to turn this around. Martin Jarmond used his goodwill to save Addazio despite a frustrated fanbase. He can ask for patience if Christian has another losing ACC season and we are an NIT bubble team, but why waste everyone's time and money. This is not working. Having been through many coaching searches, I am always frustrated by the belief among our fans and some of our decision makers about what sort of job BC is. BC people will say how tough our job is, even though our historical winning percentage is better than half of the P5 teams (and the list of coaches who have take BC to bowl games doesn't read like a Hall of Fame list of coaches). BC people will say that we can't afford a certain type of coach. Sure if we are trying to hire away a current coach from a football factory, but look at this round of hires. Look how many former head coaches couldn't even get interviewed for openings. Look at how many P5 assistants weren't even mentioned for jobs. Look at guys like Les Miles taking deader than deadend jobs like Kansas. When BC does make another big change, we may end up with a C-lister. Who knows? We don't know how Jarmond will operate. But I hope he looks for and hires the best candidate out there, because it is always a buyers market, even if BC doesn't act like it is. As Alabama pulled away early in the first half, I tended to switch from the primary broadcast to ESPN's Coaches Film Room, which included Steve Addazio. However, as Oklahoma made it interesting, I kept it on the Film Room because I found it more more compelling, in part because of Addazio. While Addazio does come off well in these things, he wasn't the star Saturday night. That was Herm Edwards. The Arizona State coach served as the quasi-host but also has such a big personality that he dominated the game. Addazio picked his moments and once again explained line play well. I also feel like he had good chemistry with Edwards, so maybe we should schedule a game with Arizona State. The biggest takeaway for me was Addazio was clearly the most conservative coach in the room. Whenever strategy came up (onsides, going for two, punting) he tended to take the conservative option. I hope these sorts of settings has him reevaluating his view. I also found his longing for option play interesting. I don't think he is going to change the offense, but he did seem to want to work in some option concepts. And it is not a bad idea, as long as we can execute it well. These sorts of opportunities for Addazio are not program changers. But it is good for him and BC to keep getting this sort of exposure. Clearly ESPN likes him because he keeps getting invited back. Multiple outlets are reporting on Disney's showdown with Verizon's Fios system, as the two sides can't agree on a new price for the Disney family of networks. The main point of contention is ESPN's new ACC Network. If the sides cannot agree, all Disney networks might be taken off the Verizon system. Most of you are probably saying "who cares?" but Fios' four million subscribers are mostly in the northeast corridor and include plenty of BC alumni. These games of chicken happen nearly every time a college network rolls out. The Big Ten dealt with it (and eventually won). The Pac 12 dealt with it and is sort of losing, as they still are not on Directv and several west coast outlets. I think ESPN will probably win this battle as unlike the Big Ten and Pac 12, they have very powerful leverage with the ESPN Networks as well as the Disney channels. Plus Verizon has multiple rivals who will gladly use this to get people to switch providers. The ACC Network doesn't officially launch until next football season, so there will plenty of work arounds established if the two sides never reach agreement. At some point in sports and BC fandom, you feel like you've seen it all. Then there is something totally unexpected, like a cancelled bowl game. 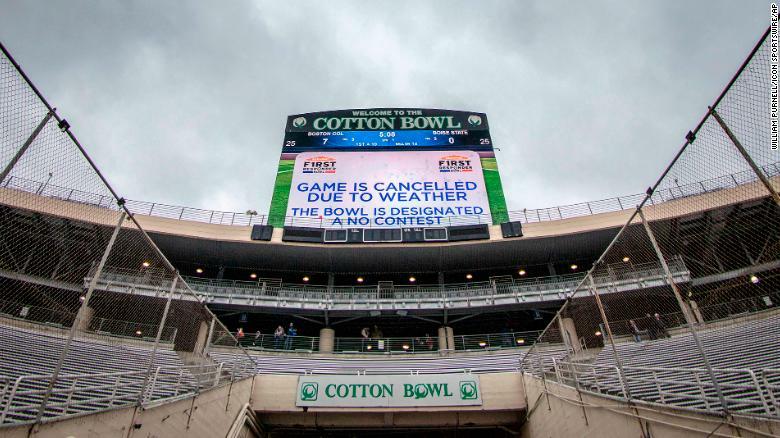 BC's got out to a 7-0 lead, things were looking good, lightning forced a delay and then another and another and finally the bowl organizers and the schools agreed to cancel the game. It is officially a no contest and never happened. And with all of these crazy bowl games, that is supposedly the first time ones ever been cancelled by weather. As frustrated as those of us who carved out time to watch were, the people who have my sympathy are the players and fans who made the trip. They sacrificed their time and money and Christmas for a game and they got ten minutes of football. We say bowl games mean nothing, but this one really did. What a waste of time and money. This was a strange season with some great highs and frustrating lows. To end in a no contest is fitting. No one knows what to make of this season. I will have some season in review posts in the coming weeks, but it is poetic that Addazio finished with seven wins again. Could this have been avoided? Supposedly the bowl organizers knew weather could be a factor but decided not to play the game earlier. Hindsight is 20/20. With the losing streak, the Alumni Stadium problems during the Syracuse game, the Addazio extension, the Texas A&M issues, and now this, it hasn't been an easy few weeks for Martin Jarmond. Let's hope his 2019 ends on a better note than 2018. If there is any lesson here (beyond the planning) is that these games really are meaningless. BC might as well push for an expanded playoff, because it will be hard to get fans to care about these sorts of games again. This is our last BC Football game for nine months. It is also the end of a strange and up and down season. I want to end with a win and it is safe to say Addazio could use one. On this day in 1994, we played Kansas State in the Aloha Bowl. On this day in 2000, we played Arizona State in the Aloha Bowl. We won both games. I liked watching BC Football on Christmas. I never went to the games in Hawaii but I liked the idea of one day going to Hawaii to watch BC Football. Maybe one day. It feels like forever since BC last played. Since the Syracuse loss, we had the non-firing (despite the media speculation) and the luke-warm extension, plus the Early Signing Day. That's a lot of BC Football stuff without any games. Addazio has spent the majority of his time talking about development and the game being a reward, but let's not fool ourselves. He needs this win. It would give him the ever allusive 8th "W" and beating Boise would probably be one of his better wins in his BC tenure. Playoff expansion talk is bound to become actual expansion. And that will likely kill or greatly reduce the number of bowl games. I think coaches and schools will still want them, but will it make sense to the TV partners? If the gravy train ends, that means BC will be home most holidays and the season will end in November. I guess I am fine with that. I like more football, but I don't think we can buy into the precious "development time" that comes with these bowl games. There is little evidence that any of these bowl practices ever made a difference for any of these BC teams the following year. The trade off for BC and fans like us, is that BC loses that development time and one more game, but we will probably make up for it with gobs and gobs of money (which will hopefully get to the players). 1. Establish the jet sweeps early. BC got away from it in the second half of the season, but I think they are critical to helping open up things for Dillon between the tackles. If they are crowding the line, we need to spread them out one way or another. 2. Shut down their running game. This will be on our DTs and LBs. If Boise can't run, we got this. 3. No Special Teams problems. When we have bad Special Teams (fumbles and missed FGs) it all falls apart. When we play well, we win. Boise won their only previous bowl game in Texas. BC is 1-1 in Texas-based bowls. It is all about Clemson. It seems like every season is a search for conference validation, so that makes the Tigers the ACC's standard bearer. I don't dislike Dabo or Clemson, so I would probably be rooting for them anyway, but it helps BC's cause to be attached to the National Champion. Zach Allen have a big game. This will be his last as an Eagle and he deserves to go out with a bang. It seems like he will probably be a very high draft pick and he was part of numerous winning teams, but he doesn't have a true signature moment like some past BC greats. Why not have one against Boise? There is defensive confusion. The Syracuse game was a mess. I can't remember that many defensive mistakes since Daz took over. If Boise creates the same confusion, this won't be close. I don't feel great about this matchup. I didn't even like Addazio's body language addressing the media this week. I don't know if he doesn't like what he sees on tape or didn't like how the extension played out, but it doesn't scream confidence. I think we have more than enough talent to win, but we cannot get behind early. Begrudgingly, I will predict a BC win (because I always do), but this game won't be close. Whoever gets up early will run away with it. The Basketball team won a tight game on the road with some good game management decisions. So that's good. But it was not a fun game to watch as the team was really sloppy on both ends and would have bean beaten by any team playing slightly better than Depaul did Saturday. BC was forced to play catch up most of the game because the offense started so cold and disjointed in the first half. I don't know if they are encouraging aggressiveness or everyone has the green light, but there were lots of bad basketball shots. Guys shooting when we don't have numbers. Guys forcing bad shots. Guys not finding the open man. Guys not reacting off the rebound. I don't know if the players are sleep walking or just not getting coached up on the seemingly simple details. On D, it was also frustrating to watch. They used zone again -- which I am in favor of -- but it wasn't good for long stretches. Depaul slowed in the second half, but we need better rebounding if we are going to keep using zone. This is BC's last resume win. I hope Depaul goes on to have a great season, to help BC's cause. But I also don't know if this team can play smart and hungry during ACC play. For those who missed this...here is Herren Jr getting a scholarship. I could go all Scrooge here and call this a waste but it is not. Herren is contributing real minutes and is showing good upside. Is he an elite ACC player? No but he is certainly a scholarship player on this team. Merry Christmas Chris. It is all hype and all projection, but even with the rollercoasters of the past week, it is clear this is Addazio's best BC recruiting class. Nearly every player had multiple P5 offers other than BC. We hit the traditional recruiting grounds and we restocked positions of need. Rivals ranked BC 57th. 247 ranked BC 55th. One thing that I found interesting is that Addazio believes the early signing period helps BC and keeps other schools from poaching more of his recruits. By the unofficial count, it looks like BC is down to 82 scholarships. Maybe there will be some additional signings -- although there is not much else out there -- or some transfers into the program. Freshman QB John Langan is leaving BC for Rutgers. The logjam at QB was going to have some repercussions, so his move makes sense. Best of luck to him. Here is Addazio's press conference. The Early Signing Day is Wednesday. As it approaches, BC's well-regarded class continues to lose members. Florida OLine prospect Maurice Smith flipped to Florida State. Michigan LB prospect Marvin Ham has decided to go to Colorado. Predictably this has created frustration among BC fans that follow this stuff. Here are two statements related to this griping, followed by my explanation. 2. Keeping Addazio to protect this class was stupid. It wasn't mentioned in the extension press release, but I do know that this recruiting class was a factor in keeping Addazio. That was extremely short-sighted. You don't keep a coach because of one batch of recruits. You keep a coach because of a body of work and if he is maximizing the program's potential. In the end this recruiting class will be fine. Addazio's most redeeming quality is that he's proven to be a very good talent evaluator. He has upgraded the talent across the board and most of his recruits have exceeded their ratings coming into the program. If ratings hold and his past evaluation skills carryover, this will be his best class yet. My concern and fear is that his other pattern (of mismanaging games) will negate this increased talent and he will continue to underachieve while at BC. Chris Herren Jr had his best game to date as BC beat Fairfield Sunday. While the Herren game was a nice surprise, being in a tight game with Fairfield and needed one of your reserves was far from ideal. Bowman was really cold (4-17) and the bench was really thin with Chatman and Mitchell both sitting with injuries. BC is off for a week and then takes on Depaul next weekend. Considering it was one cancelled basketball game, this Texas A&M issue seems like it will linger around BC sports for a little while longer. According to a report out of Texas (and based on a freedom of information request), A&M wants their $100,000 cancellation fee for the BC game. Supposedly their side will decide on a course of action this week. I don't have any access to BC's contract, but I imagine that there is a cancellation fee on our side of the contract too. So if A&M decides to cancel their visit to Conte, BC is potentially inline to collect that money. In the end I imagine this will be settled between the Athletic Departments. I don't think much or any money will change hands. What's surprising is that A&M is so adamant about this. As I've pointed out many times, College Sports is a small world. Usually both sides would try to settle this behind the scenes and amicably. Narrative drives everything in college football, so it should be as no surprise that in their short summaries, the major websites are saying the same things about BC and Boise. Yahoo: thinks Boise wins and might not be much of a game. Bleacher Report: predicts a Boise win and mentions BC flaming out down the stretch. BC didn't look great and were without Chatman, but it didn't matter as they beat Columbia at Conte. The D -- which had looked so good during the win streak -- was a mess tonight. Lots of slow rotations and confusion. Bowman scored well but still turned the ball over too much. Tabbs had another strong game. The team's next game is against Fairfield on Sunday. BC and Addazio out of limbo, so now what? When is an extension, not a real extension? When your own press release buries the news in the fourth paragraph on the announcement. The message from Jarmond is light on specifics and lacks any dollar signs (which is typical of BC). It only explains that Addazio's contract was extended for two years. The extension had to be done. BC was in an untenable position...of their own making. But why did they do it like this and what does the future hold? Clearly BC is frustrated with Addazio. You don't start your message off with we wish we had won more if everything is wonderful. But following the losing streak and the rumors, BC had to say or do something. In College Football it becomes very hard to lock down quality recruits and a quality staff if there is much uncertainty. This public extension provides some relief to Addazio's recruits and anyone he is going to try to bring on as a new staffer. (But as the Coen news mentioned, most of the new hires will probably ask for and get a two-year deal.) That was the only reason for the extension. 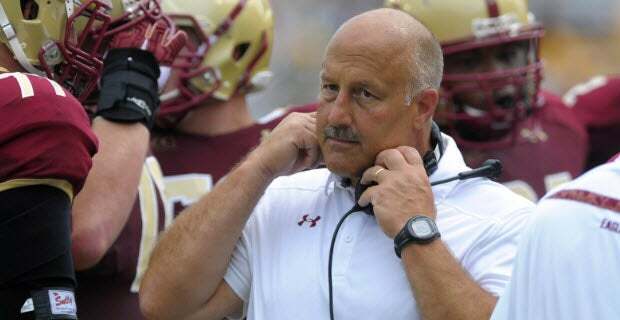 There are no other suitors out there trying to hire Addazio away from BC. He wasn't walking away either. This settles the public aspect. Behind the scenes is a little different. You don't drag negotiations after six years, no suitors and a .500 record if you want to secure and pay your coach for the long term. You don't have to because you are negotiating against yourself. While there was incentive to help recruiting, there was no incentive to help the Steve Addazio retirement fund. I don't know any of the specific financials of the deal, but do know that this new commitment won't be a financial obstacle if BC decides to make a change next year. This means that Addazio is coaching for his job. He's got the talent, the practice facility, a schedule he handpicked, his best recruiting class, a veteran QB and playmakers all over the roster. There are no excuses. And if he doesn't break his ceiling, he will be done. Knowing this only makes me frustrated with how Martin Jarmond played this. As I said the Sunday after the Syracuse game: Addazio is either the right guy or not. We are not learning anything new in Year 7 that we don't already know in Year 6. He is who he is. While that had value at a certain point to BC and while he does deserve credit for building BC up after Spaz, at what point do we say we can be more? It is a risk, but I think it is a risk worth taking. Jarmond himself has even said in sports you are getting better or you are getting worse. Does he really feel we are getting better or are we stagnant? I don't know how this will end. My gut tells me it will end with seven wins in 2019 and Addazio being fired. I hope I am wrong because that will mean we wasted a year of everyone's time. Texas A&M Basketball Coach Billy Kennedy announced that his team won't be travelling to Boston next year for the scheduled home and home. Basketball coaches usually have control over their schedules, so I could see why Kennedy thinks this, but we have no official word from Texas A&M. They are under contract, so the AD might have to weigh in on if the series is actually off. If they do cancel, I hope our penalty matches their $100,000. What's interesting is BC and Martin Jarmond are defending their position on social media. They care what is being said and how this is being perceived. I imagine no one wants to play this series now but saving face and money is the priority. With all this nonsense you know this means the two teams will end up playing each other in the postseason somewhere...or we will end up against Texas A&M in a bowl game soon. Long story short, but I've worked in the airline space and in the charter airline space. There is a bit to unpack in BC-Texas A&M's cancellation, but this is not about BC screwing up or having an inferior charter partner. 1. BC's charter company is the same one as Texas A&M's and handles the vast majority of the ACC, SEC and Big Ten. People love to complain about BC's decisions and accuse BC of going cheap, but we are using the premier company for college sports. It is the company every major basketball program uses. This could have happened to Duke, Louisville, Kentucky, etc. 2. All Travel Managers (charter brokers) use sub contractors. The charter business is all about subcontracting. Once again, all college basketball teams deal with this. The company whose plane had the mechanical issue (Elite) is a reliable and big company. The second sub contractor used and mentioned in the BC announcement (Via) is not as big but still a good operator. If their pilot didn't want to fly in the weather or was worried about the necessary refuel in the bad weather across the country, then you don't fly. 3. Texas A&M was inflexible on the reschedule. Think of how often this is done (we did it with Wake Forest football this year). We've done it outside the conference too. A&M would not play the game later on Saturday nor any time on Sunday or even Monday. This is unfortunate since I we could have used a win. My guess is with the finger pointing, this future series won't happen. This was fun to watch again (especially since BC held on to win). Lots of familiar names. The most impressive thing in retrospect was the offensive line play. Truly controlled the whole game.